The success or failure of businesses often depends on how well organizations use their data assets for competitive advantage. Deeper insights from data require better information technology. As organizations modernize their IT infrastructure to boost innovation rather than limit it, they need a data storage system that can keep pace with highly virtualized environments, cloud computing, mobile and social systems of engagement, and in-depth, real-time analytics. Making the correct decision on storage investment is critical. Organizations must have enough storage performance and agility to innovate as they need to implement cloud-based IT services, deploy virtual desktop infrastructure, enhance fraud detection, and use new analytics capabilities. At the same time, future storage investments must lower IT infrastructure costs while helping organizations to derive the greatest possible value from their data assets. The IBM® FlashSystem V9000 is the premier, fully integrated, Tier 1, all-flash offering from IBM. It has changed the economics of today’s data center by eliminating storage bottlenecks. Its software-defined storage features simplify data management, improve data security, and preserve your investments in storage. The IBM FlashSystem® V9000 SAS expansion enclosures provide new tiering options with read-intensive SSDs or nearline SAS HDDs. IBM FlashSystem V9000 includes IBM FlashCore® technology and advanced software-defined storage available in one solution in a compact 6U form factor. IBM FlashSystem V9000 improves business application availability. It delivers greater resource utilization so you can get the most from your storage resources, and achieve a simpler, more scalable, and cost-efficient IT Infrastructure. 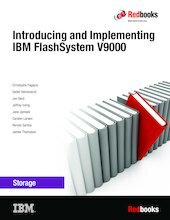 This IBM Redbooks® publication provides information about IBM FlashSystem V9000 Software V7.7 and introduces the recently announced V7.8. It describes the product architecture, software, hardware, and implementation, and provides hints and tips. It illustrates use cases and independent software vendor (ISV) scenarios that demonstrate real-world solutions, and also provides examples of the benefits gained by integrating the IBM FlashSystem storage into business environments. This book offers IBM FlashSystem V9000 scalability concepts and guidelines for planning, installing, and configuring, which can help environments scale up and out to add more flash capacity and expand virtualized systems. Port utilization methodologies are provided to help you maximize the full potential of IBM FlashSystem V9000 performance and low latency in your scalable environment. This book is intended for pre-sales and post-sales technical support professionals, storage administrators, and anyone who wants to understand how to implement this exciting technology. FlashSystem V9000 version 7.8 update: Size does matter!